This recipe is quick to assemble, and can be prepared in advance if the chicken is fully cooked for 20 minutes in step 1. Preheat the oven to 200°C, gas mark 6. Cut the chicken into chunks, place in a large, 3 litre, shallow, ovenproof dish, stir in the oil and garlic to coat and cook in the preheated oven for about 10 minutes. Meanwhile, place the penne in a large pan of boiling water and cook according to the instructions on the pack. When the pasta is just cooked, drain and return to the pan. 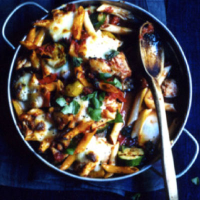 Stir in the grilled vegetables, the pasta sauce and basil leaves, then stir into the part-cooked chicken pieces. Season with freshly ground black pepper and mix thoroughly. over the top with the torn mozzarella and return to the oven for about 30 minutes or until the mozzarella is golden and bubbling and the chicken is thoroughly cooked and there is no pink meat. Serve with a crisp green salad, garnished with fresh basil.